Using a VGA cable and an interface both ends, we will supply the interfaces in two different colour boxes - Black with transformers, White without transformers for current versions of the TMC-1-XMon. The next production run of the TMC-1 will have a VGA connector fitted as standard and only one converter is supplied. 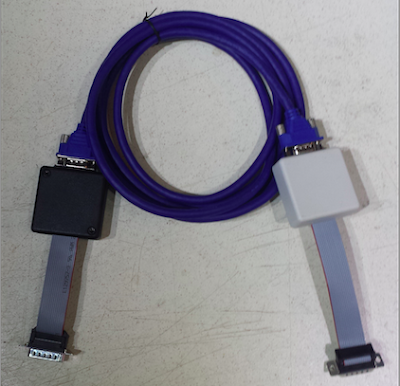 We stock 5m VGA cables as shown and can supply 10m, 15m and 20m VGA cables. Noise - the noise performance is also related to the power supply, to use the HUI interface on the TMC-1 it may be necessary to use a powered hub to remove any power supply noise generated by the computer.